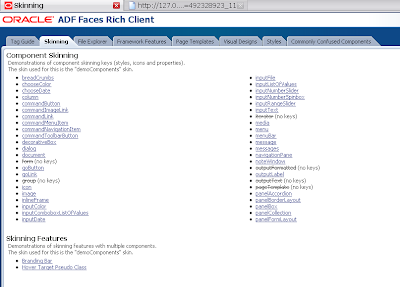 With JDeveloper 11G you can change every ADF Rich faces component with CSS. This is called Skinning. In this blog I made an example workspace and I will show you what to do if you want to apply Skinning in your web application. First we can add a new css file to the project. If you want to test your css the you should change the CHECK_FILE_MODIFICATION context parameter to true. ( This is located in the web.xml ). Now you can change the css file and press F5 to refresh the page to see the result without restarting the web application. 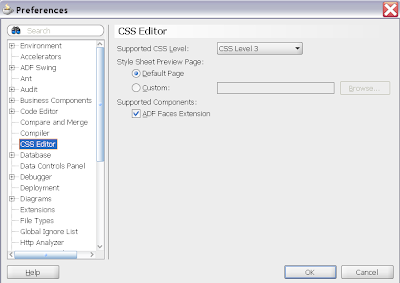 We need to use CSS level 3 and enable ADF faces Extension. ADF will automatically converts this to a level 2 css file. Open the JDeveloper preferences window to change this. There are some great reference resources for Skinning, the first resource is located in the JDeveloper help. 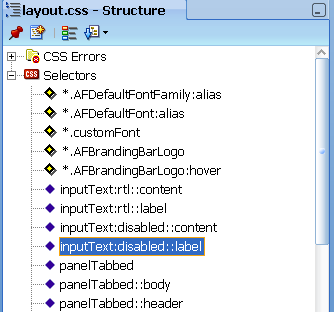 JDeveloper provides some css tools to help you, but these tool does not work so well. Oracle must take a look at Adobe Flex, that's is working perfectly ( maybe next version). 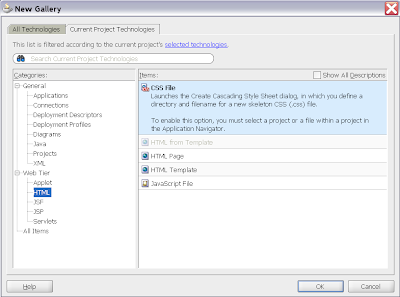 Here is an image of the css structure window. JDeveloper also has a property window. 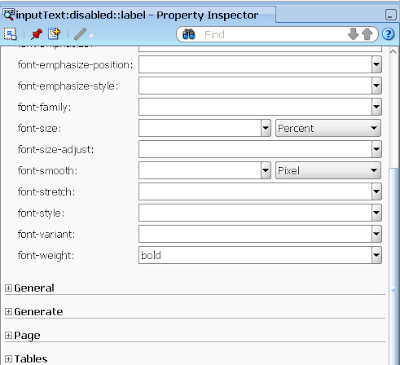 It will show you all the css properties and not the properties which can be used by component selector. The only what works is to open the css file and do it yourself. JDeveloper helps you with the possible options. Here is my example workspace which you can use and test it yourself. The second refrence where we can learn about Skinning( the Demo where we can actually see the skinning) , the Link is not working. Yesterday it was working. please help. Hi , the link is working again. 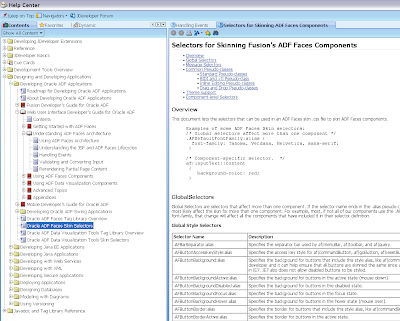 This is the best post to learn about ADF 11g skinning, really good. Just a small request, the second reference ( the link that was fixed in your previous post) is broken again. I am back on Skining and I see the seconf reference --demo on skinning takes forever to load and hangs...please help. Thanks in advance. I happened to notice that the Demo is not loading .... I am using IE7 version....thanks. I know this post is older, but maybe someone here could help. We have an issue where occasionally our ADF applications will LOSE their skinning, or in other words load without loading the css. The whole screen is a jumbled mess. Only clearing the temporary files and the cache seems to fix it, and even then, sometimes it takes a reboot of the managed server to correct. Has anyone ever experienced this? Any idea where to look? is this on your production servers or in your integrated weblogic instance. Just like that or with redeployment. you can use an EL expression or a managed bean on the styleclass attributes of the JSF components and then use partial page rendering to refresh the components.